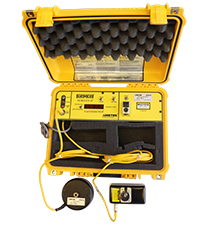 The Gemco 1999 Semelex II Safetimeter test set is field proven to accurately measure stop time and safety distance to verify compliance with federal and state requirements. It is designed for harsh industrial environments, and is portable, light weight, and easy to use. The 1999 Semelex II Safetimeter is a self-contained, portable electronic stop time meter capable of measuring elapsed time, stop time (Ts) from 1-9999 milliseconds. It also calculates the minimum safety distance (Ds) based on the OSHA formula, as understood by the factory, and will display up to 999.9" to the nearest 0.1". It is the same unit OSHA uses when they perform tests in your facility.